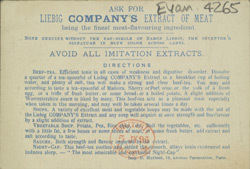 This is an advertisment for Liebig's Extract of meat. The Liebig Company produced a meat extract in the early 1900s, and the well known ‘Oxo Cube’ was produced a few years later. Liebig’s Company commissioned architect Albert Moore, to design a factory along the banks of the River Thames. He designed the art deco tower which we now recognise as the ‘Oxo Tower’. Initially the company’s name was spelt out in electric lights but this was rejected by London County Council so instead a geometric design was created on all four sides of the tower that just happened to spell ‘OXO’. This ‘advert’ could be seen as far away as Hampstead.